Distance of highlighted hike below: 11.1 miles via Knife Edge Trail which includes Pamola Peak, Chimney Peak and South Peak. Mount Katahdin, Hamlin Peak is a 4,756 foot mountain in Baxter State Park in the state of Maine just northwest of Millinocket. As well as being the tallest mountain in the state of Maine, It is one of the Northern-most New England 4,000 Footer Mountains. Baxter peak is the taller of the two peaks on the mountain; the other peak being Hamlin at 4,756 feet. Katahdin literally means Greatest Mountain, so it was, at one time, being considered to be called Mount Greatest Mountain instead of Mount Katahdin, but in 1893, the U.S. Board on Geographic Names made their decision. There is an abundance of wildlife that can be seen on and around Mount Katahdin including black bear, deer, moose, black flies, mosquitos, Katahdin Arctic (an endangered species of butterfly), and many bird species including Bicknell's Thrush, songbirds and raptors. The flora includes pine, spruce, fir, hemlock, beech, maple, birch, aspen, and more. 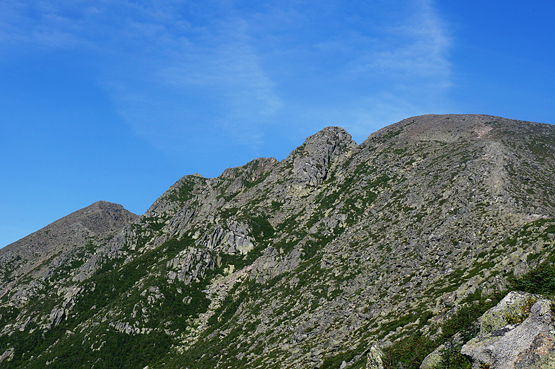 The first recorded ascent of Mount Katahdin was by Zackery Adley and Charles Turner Jr. in 1804. Other famous people who have climbed the mountain include Henry David Thoreau, Theodore Winthrop, Frederic, Edwin Church and Marsden Hartley. The Appalachian Trail, which spans from Georgia to Maine, ends after it summits Mount Katahdin, so it can be a pretty celebratory place. 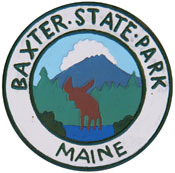 Overnight camping in Baxter State Park is permitted, but only from May 15 - October 15. Though the park is open all year long, but strictly regulated in the Winter. 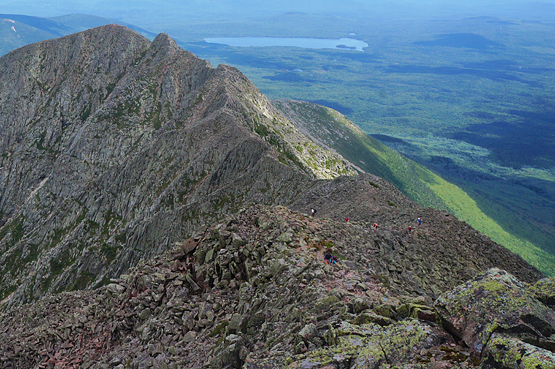 Probably one of the most famous hikes to the summit of Katahdin is Knife's Edge, which traverses the ridge between Pamola Peak and Baxter Peak. The mountain has sadly claimed over a dozen victim's lives from extreme weather and falls on Knife's Edge since 1963. Baxter State Park does close the trail from time to time when it is windy. The trail is as narrow as 3 feet wide for almost half a mile on this trail. Mount Katahdin, Baxter Peak is a 5,268 foot mountain in Baxter State Park in the state of Maine just northwest of Millinocket. As well as being the tallest mountain in the state of Maine, It is one of the Northern-most New England 4,000 Footer Mountains. Baxter peak is the taller of the two peaks on the mountain; the other peak being Hamlin at 4,756 feet. Katahdin literally means Greatest Mountain, so it was, at one time, being considered to be called Mount Greatest Mountain instead of Mount Katahdin, but in 1893, the U.S. Board on Geographic Names made their decision. 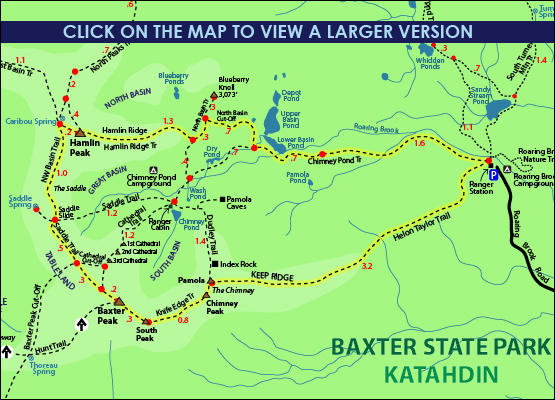 The map below shows how to get to the summit of Mount Katahdin, Hamlin Peak, as well as Mount Katahdin, Baxter Peak. There are many routes you can take, but these directions will explain how to do the big loop including Hamlin, Baxter, Pamola, Chimney and South Peaks. Beginning at the Roaring Brook Campground parking area, take the Helon Taylor Trail which starts just after the Ranger Station. 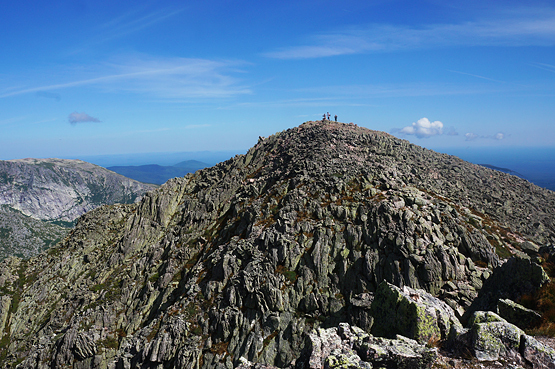 Hike up this trail for 3.2 miles where you will reach the summit of Pamola Peak and get your first view of Baxter Peak straight across. (This next part is the most difficult part of this entire hike.) 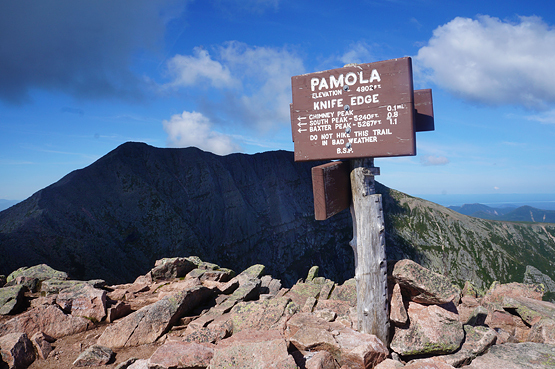 From Pamola, begin the knife edge trail by hiking down and up to Chimney Peak. This section is known as "The Chimney". From Chimney Peak, continue along the Knife Edge Trail for roughly 0.6 more miles until you reach South Peak. From there, Baxter's summit is just 0.3 miles away! To continue on the loop over to Hamlin Peak continue straight over the Baxter summit towards the Saddle Trail. From Baxter, hike for 1 mile (passing the Cathedral Trail at 0.2 miles and the Cathedral Cut-Off Trail at 0.5 miles) where you will reach the Saddle Slide Trail on the right. Stay straight on the NW Basin Trail and hike for 1 mile until you come to a junction where Hamlin Peak is just 0.2 miles to the right. 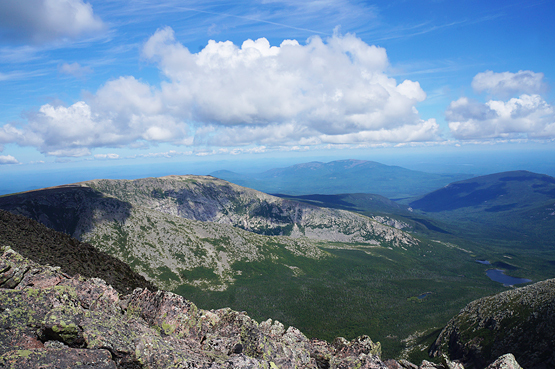 View from the Knife Edge Trail looking towards Hamlin Peak on August 20, 2014. 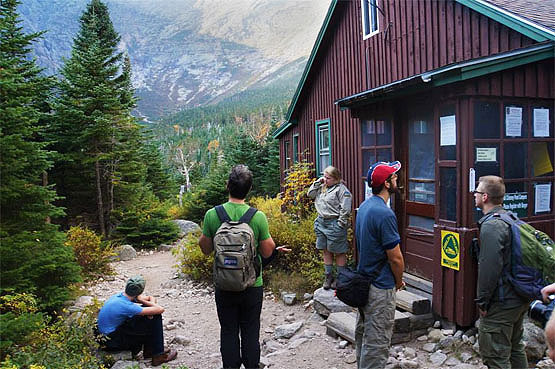 Ranger Cabin near Chimney Pond in October, 2013. Summit of Pamola Peak with part of the Knife Edge Trail in the background and Baxter Peak. Looking back to the summit of Pamola Peak from the Knife Edge Trail on August 20, 2014. 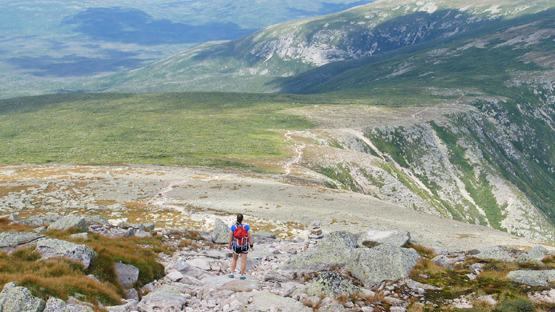 Looking back at the Knife Edge Trail (while still on it) heading up to Baxter Peak on August 20, 2014. 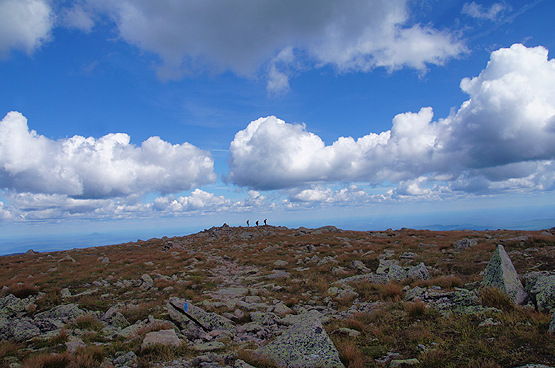 Almost at Baxter Peak's summit from the Knife Edge Trail on August 20, 2014. 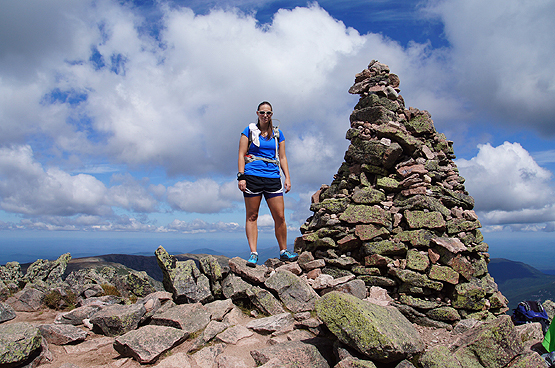 Summit cairn on Katahdin's Baxter Peak on August 20, 2014. 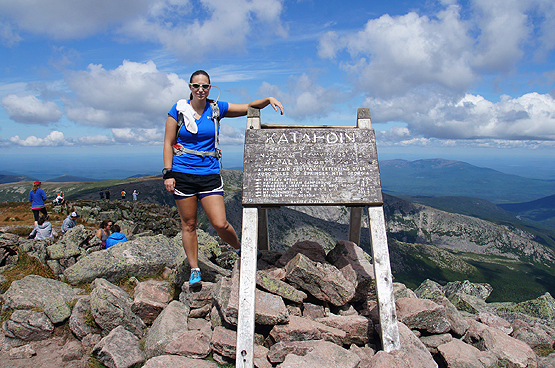 Summit of Katahdin's Baxter Peak (also the end of the Appalachian Trail) on August 20, 2014. About to start the hike up towards Hamlin Peak on August 20, 2014. 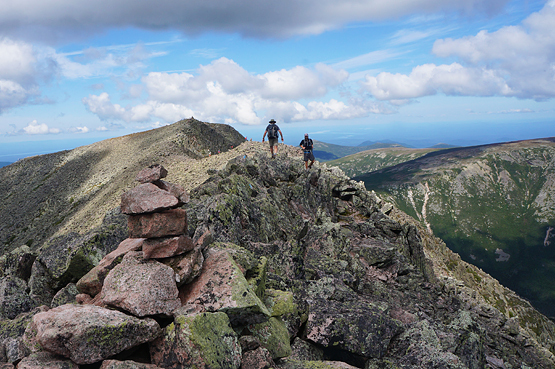 Hikers on the summit of Katahdin's Hamlin Peak on August 20, 2014. If you have a GPS, you can enter Baxter Park Road or Roaring Brook Road in Millinocket, Maine and drive all the way to the end, passing the gate which is open May 15 - October 15 from 6am-10pm and October 16 to the end of the season from 6am-7pm. From I-95, take exit 244 for ME-157 towards Medway/Millinocket. From the exit ramp, turn left onto 57 West (Medway Road). Drive 11.3 miles and turn right onto Katahdin Ave. Drive 0.2 miles and take your second left onto Bates Street. Drive 0.9 miles and continue onto Millinocket Road. Drive 6.1 miles and continue onto Millinocket Lake Road. Drive 1.1 miles and continue on Baxter Park Road. Drive 6.8 miles and turn right to stay on Baxter Park Road. Drive 3.6 miles and continue on Roaring Brook Road and drive to the end.